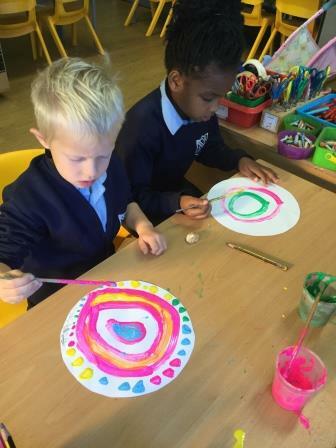 The children in Reception have had a wonderful time celebrating the Chinese New Year, the Year of the Pig, which fell on 5th February. 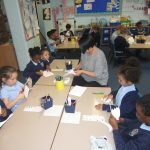 What a good time the children have had learning about China and its culture. They enjoyed playing in the “Hungry Pig Chinese Restaurant” and they had a great time making their own real “Stone Soup” and eating it. Some found the chopsticks a little tricky. The children have been practising their drumming skills and made two wonderful Dragon heads for a traditional Dragon Dance through the school. It was definitely difficult not to notice them! What a welcome they received when they visited Nursery and the KS1 and KS2 classrooms. Happy New Year everyone! – or as they say in China – Gung Hay Fat Choy. 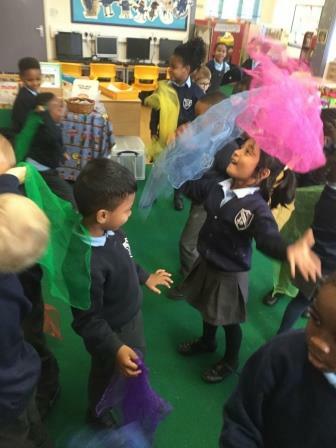 What a treat Nursery and Reception had last Friday, when the Hobgoblin Theatre Company came to school to give the children a theatre experience in our own school hall. The children were delighted with the performance of Goldilocks and the 3 Bears. After the show, the children were also treated to a workshop where they used their bodies and faces to perform some of their favourite fairytale characters. The parents also joined in. What a great time we had. Reception have been visiting our church. We tried to go in the big doors but they were closed. Luckily, we had a key to a secret door. We crept in quietly and had a good look around the church. We then had a sit down in the church pews where we will be sitting on Monday next for our Harvest Festival. The children very much enjoyed the visit. What a nice day Reception have spent chopping up fruit for our healthy fruit salad. The children all tasted the fruit salad and some wanted second helpings. The children have had a great time settling into their new school. 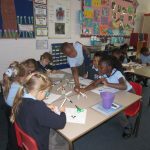 They have been getting to know each other, making friends and exploring their new learning environment. Here are some photos. 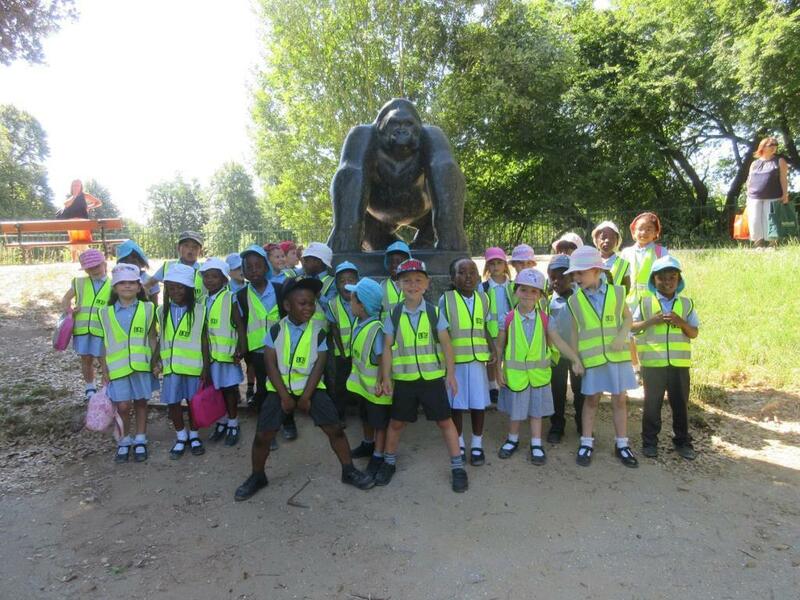 It was a hot and sunny day when Reception class visited Crystal Palace Park and Farm. The children had a lot of fun learning about all the animals in the farm. There were pigs, lambs, goats, ponies, chickens, geese, rabbits, guinea pigs and an owl – but they were very surprised and excited to also meet some exotic animals. They had the opportunity to touch the snake and the bearded dragon. After visiting the farm, the children cooled off and ate their lunch. They then went on a tour of the dinosaur trail. The children had a little play before returning to school. What a lovely day! Crystal Palace Park Farm is free to visit and open every day from 12 – 4pm. It’s well worth a visit during the summer holidays. Thank you Miss Maat for coming with us. 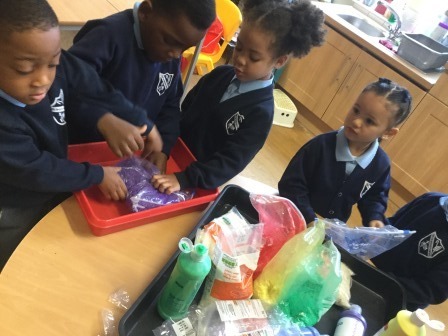 The Reception children had a wonderful visit to Eltham Environment Centre on Wednesday. The weather was marvellous and the children were very excited to go on their first coach trip together. At Eltham we searched for minibeasts – first we looked in the pond. They had great fun fishing around with their nets. They examined their catch carefully, before returning the little creatures back to the pond. They then found lots of creatures under logs and stones. In the afternoon the children had a walk past the beehives and learned about how the bees stick out their tongues to collect the nectar from the flowers and how they also collect pollen and spread it from flower to flower. We then went into the woods where they did a little art project using natural materials to make minibeasts. What a fabulous day they had in the sunshine! Click on the picture to make it bigger. Comments Off on Summer has arrived! We Read Every Wednesday Morning! 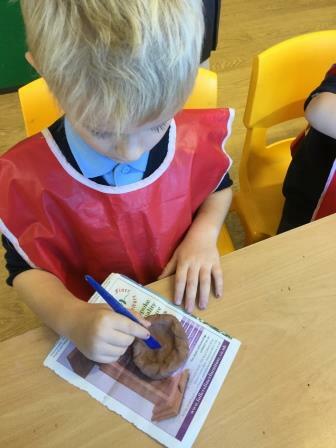 The Reception children are now in a good routine of reading on Wednesday mornings. Parents and carers are warmly invited to join us between 8.45 and 9.15am on Wednesdays to share a book with the children. Do come along when you are available. Comments Off on We Read Every Wednesday Morning! This year our book topic for Book Day was Little Red Riding Hood and we had three little Red Riding Hoods. 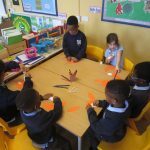 The children had fun learning the story and making their own story maps. We also learnt a song about the colour red. 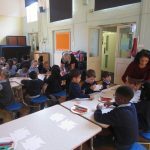 In the afternoon we had a book quiz based on our favourite books in Reception. The children wrote their answers on their whiteboards. Their first ever quiz! Everybody did very well. Here are a few pictures of our day.